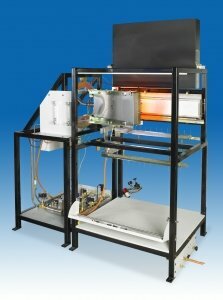 This instrument uses a gas-fired radiant panel to assess surface flammability of marine surface finishes (ASTM E 1317, IMO) or to assess lateral ignition and spread of flame (LIFT, ASTM E 1321, ISO). The gas-fired radiant panel is controlled by a fully automatic spark ignition safety interlock system, for operator safety. A pilot burner is used to ignite the test specimen. Critical heat fluxes for ignition and flame spread are calculated, as required in specifications for the marine industry and for research. A stack is provided with thermocouples/thermopile as required by the standards. The complete test apparatus consists essentially of three main components: a radiant panel support framework, a specimen support framework (linked together to bring the test specimen into the required configuration with respect to the radiant panel) and the specimen holder. The apparatus is provided with all necessary controls, flux meter and specimen holder. The instrument is provided with software for obtaining all needed data, making the calculations and storing test data. All needed controls feed, via a data acquisition unit, into a personal computer. Smoke obscuration measurements are an optional add-on, via a smoke sampler in the exhaust duct. The option includes 0.3 and 0.8 neutral density filters for calibration. Other options include a pyrometer, with its digital display units and cables.